Preparing and Delivering Sermons: When it comes to sermon preparation and delivery, it is something that we learn and develop while on the journey. After four years of seminary, I had enough knowledge to begin my preaching ministry but as time went on I realized I still needed to continue to develop and fine tune the process. I have found teaching students the process of preparing and delivering sermons to be inspirational in my own journey. It has made me examine, collate and package teaching materials on this subject. Subsequently, I have divided sermon preparation and delivery into three subjects: preparation, procedure and presentation. The preparation stage is about study – studying the Scriptures which you have decided to preach. I usually preach through books of the Bible and most of my topical sermons have come from preaching through the books of the Bible. There are different ways to study the biblical books you are going to preach. First I like to do an in depth background study to the book I am going to preach. Once I have studied the background material to the book, I prefer to diagram the text in its original language to see the relationships between the elements within the text and the flow of thought in the text. I am proficient in New Testament Greek so I find this quite easy. If you are not proficient in Greek, you can use a mechanical layout of the text in English. When it comes to the Old Testament Hebrew, I tend to outline the text with a mechanical layout in English. Again this helps me to understand what the original writer’s intent is. Let me also say that this is hard work. It takes time and hard work to study and understand the Scriptures so that you can teach it to your congregation. The procedure stage is about packaging the information from your study of the Scriptures so that you can communicate it to your congregation. This will involve writing a sermon outline, sermon content with appropriate illustrations, an introduction and a conclusion. You can do this by writing a deductive sermon, an inductive sermon or a bit of both. You will need to be creative when it comes to creating sermons. 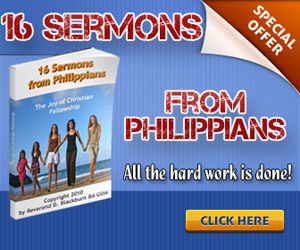 Sermons outlines need to be clear, cohesive and sequential with a natural flow to them. The presentation stage is the delivery of the sermon to your congregation. This is one area that preachers need to work on. Our preaching style can be nurture and developed. After all, we bring much to the pulpit when we preach like character, personality, passion, beliefs and methodology. Diagrammatical Analysis by Lee L. Kantenwein. Understanding and Applying the Bible by Robertson McQuilkin. Teaching With Style, DVD Set by Bruce H. Wilkinson. The 7 Laws of the Learner by Bruce H. Wilkinson. Teaching With Style, the Seven Laws of the Teacher and The Seven Laws of the Learner, by Howard Hendricks and Bruce Wilkinson.